The Kumho Solus KH25 is a high performance touring tire specially developed for drivers looking for all-season traction, quick steering response, and ride comfort. 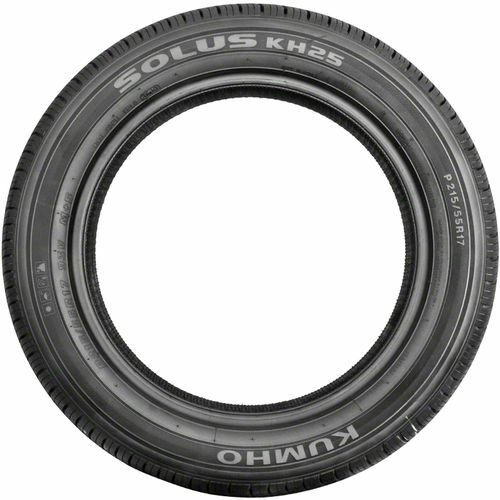 Ideal for sport sedans and mid-level family vehicles, the Kumho Solus KH25 is the best choice for a family car. It can be found in today™s most popular family cars like the Ford Fiesta, Hyundai Veloster, and Hyundai Sonata. 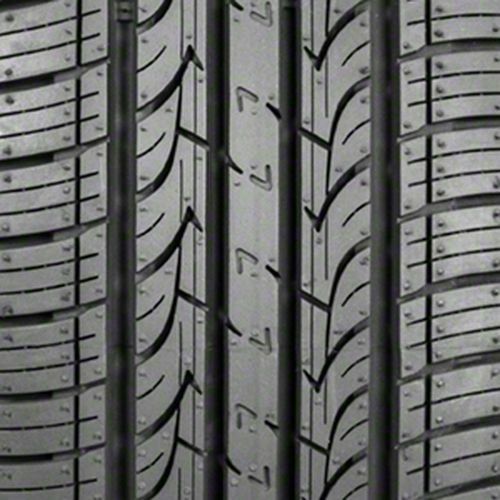 It features a silica-enhanced tread compound molded into a symmetric tread pattern to provide all-season traction. The symmetric tread design consists of full-depth circumferential grooves which enhance traction in both wet and snow-covered road surfaces, as well as variable-pitch lateral grooves which reduce noise. This means you get wet weather traction while enjoying a quiet ride. The internal structure consists of twin steel belts reinforced by spirally wrapped nylon for an enhanced stability and durability even when driving at high speeds. To get the most out of the Kumho Solus KH25, it is recommended to use them in sets of four. 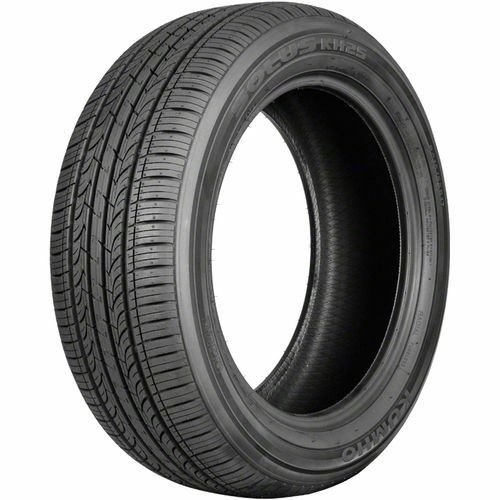 P205/50R-17 480AA 1,279 lbs 0 psi 0/32nds N/A 0" N/A 25"
Purchase includes the Kumho Solus KH25 tire only. The wheel rim shown in the picture is not included. Picture provided is a stock picture from the manufacturer and may or may not reflect the actual product being ordered. All Kumho Solus KH25 tires are continuously developing with manufactured improvements. With that said, Simple Tire and the manufacturers have the right to change these tire specifications at any time without notice or obligation. Please Note: Specifications of the Kumho Solus KH25 tires shown above are listed to be as accurate as possible based on the information provided to us by Kumho tires. Bought my KH25s used with alloy wheels & half tread. 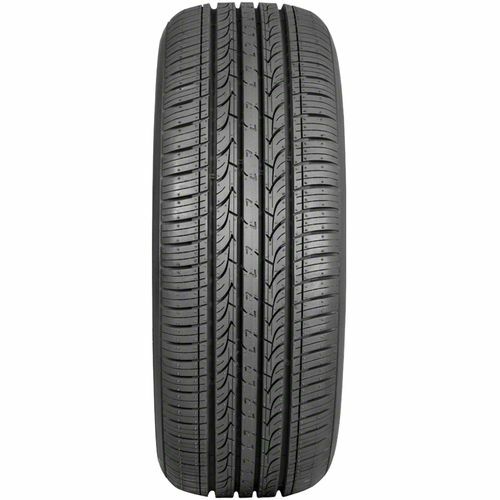 Tho they are very low profile (40) aspect tires, they are smooth, moderately quiet, & steer just OK on the front tires. They track on-center strongly, to the point that a very little steering wheel input ISN'T ENOUGH to begin turning the car! Wear is quite low. Tho half tread, I've traveled 16,000 miles, with 5000 to 10,000 miles remaining. While not being careful, the low aspect tires easily cause curb rash. Altho I've hit fair sized bumps, I haven't gotten any other alloy damage than the curb rash. Decent tyre, wiht very good traction on dry and wet conditions. Poor snow traction and a bit noisy. Tread life "so so", I got very close to the replacement mark at around 40k miles. By submitting a review, each person received a sweepstakes entry.